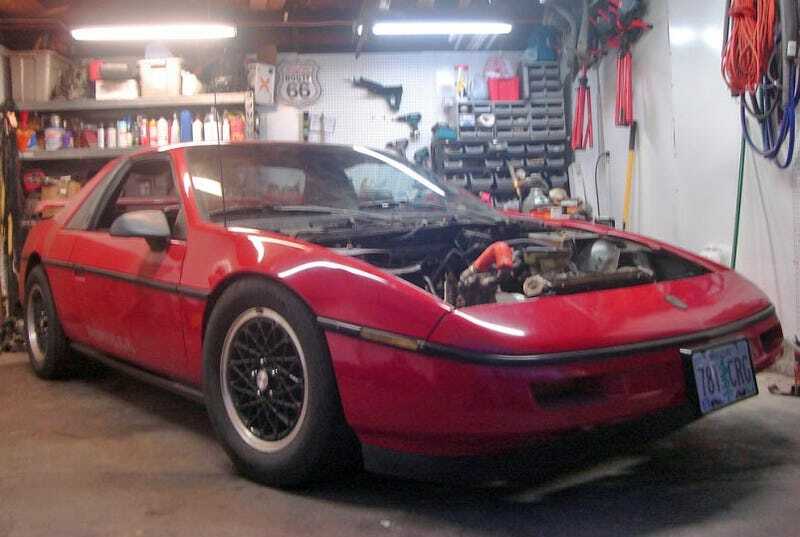 This is a hybridized Pontiac Fiero, but it doesn't work like you might think. Instead of some fancy trickery with the gas engine, this one uses an electric S10 motor to power the front wheels. The hybrid Fiero is being built to compete in the Grassroots Motorsports $2009 Challenge, which means it has to cost no more than that sum of the year and will compete in an autocross, a drag race, and up-close judging. That's right, when this monster is done, it'll get raced. So what's in it? First and foremost, the original GM four banger is staying in place, powering the rear wheels as it has since 1988. But the front wheels are getting a comprehensive rework. Instead of the boring, un-powered design it was originally given, the builder has decided to plop in a 114 HP electric motor pulled from a scrapped electric Chevy S10 between the wheels. This is essentially the same unit which powered the EV1. It'll get power from a couple of battery packs from junked Prii hacked together for more power.